How come we don't seem to have a discussion going about this new nifty little thing? The Verge Review - 8.5 points. I got mine yesterday -- works like charm with Google Music and Youtube on Android, as well as within Chrome on a PC. 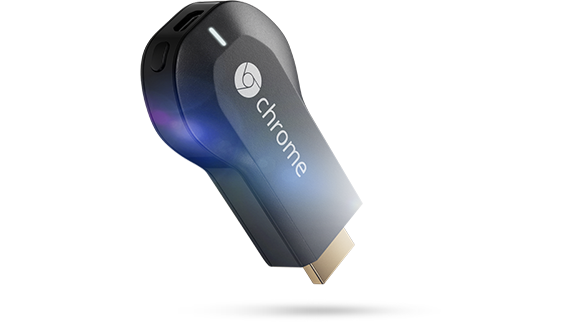 Does anyone know of a good Android app that can stream any audio or video to the Chromecast? I'm thinking of adding a cheap tablet as a control center in my living room, but I'd like to be able to stream anything to it from apps that don't yet support the Chromecast natively. Plex's Android client is free on the Amazon marketplace right now. You should definitely pick this up if you are interested in streaming media files from your computer to your Chromecast. Chromecast now supports mirroring from Android devices. I would love to hear from anyone on how well it works. Between Android Wear and Android TV, I'm strongly considering going Android this Autumn. Does anyone know if the Chromecast's unsecured wi-fi network presents a real vulnerability? Can it be secured? I would love to hear from anyone on how well it works. Chromecast is not a very powerful device, but I guess the burden lies mostly on the device and not the dongle. I'll update tonight and--wait I'm getting drunk today. I'll update tomorrow night and send feedback. Anything on par with Apple's AirCast is good enough for me. I just tried it out on my Chromecast with my Galaxy S5, and it seemed to work quite well. It seemed to have very little lag. It is great for showing photos and videos from your phone. I also used it to play a round of Star Realms (a card game), and it was great for that since it can sometimes be difficult to see the card art and tiny text on my phone. Some of the card animations were a little janky/stuttery, however. I am on a 801.11g network, so maybe they would have been a bit smoother on a faster LAN. Video playback was smooth, however. I will experiment with some more games tomorrow. BTW I had to manually install the latest version of the Chromecast app to get it to work. I guess it isn't yet on the play store. Oh... It didn't even occur to me that it would be over wifi... hmm, my internet is not the best, I'm curious how this will work for me. Oh this is great fun with the camera app! Screen-casting to Chromecast is also available on Moto X with the latest 1.7.4 APK with a minor hack -- Google Play Services need to be downgraded back to the factory version. This, however, breaks a lot of apps. I'm interested in picking up a Chromecast, but I'm out of HDMI ports. Can anyone recommend an HDMI switcher? It can't do automatic switching, since that doesn't work well with always-on devices, and it needs to be compatible with a Harmony remote. This Kinivo switch works with my Harmony. The LED's are a bit bright, though. A toothpick and small dab of a nail polish fixes that. I just use electrical tape. Thanks. I keep hoping that google fiber will just add native casting support for their music service to the fiber TV boxes, the way they already have for youtube and netflix. They will probably add it the day after I buy a chromecast and switcher. I rarely use my Chromecast these days as my Xbox One does just about everything I need.. but wouldnt a Fire TV Stick be a better investment at this point? It might be, but I'd be using the Chromecast primarily for music. I've already uploaded all of my music to Google Play, so it's a way to have both my personal collection and a music subscription contained in a single app that can be cast from my phone to my home theater with a single click, and no need to fire up my 360 to do it. Google has released an Ethernet adapter for ChromeCast. It's a welcome addition to my setup, because while the Wi-Fi signal strength near my TV is sufficient for music and photos streaming, it's not good enough for HD video. The adapter utilizes the USB port on the ChromeCast to provide both power and the Ethernet-over-USB. The setup is completely straightforward plug-and-play. While DYI USB OTG power adapter + USB Ethernet dongle solutions existed before and are documented by Google itself, this new product is just a cheaper, neater all-in-one solution. Huh, that would work really well for me as my Chromecast is right next to where I'm running ethernet for a couple consoles. Wonder if that'd allow you to get around the sign-in requirement on a lot of hotel wifi connections. Google has released an Ethernet adapter for ChromeCast. Will it allow Chromecast to do 1080? AFAIK nothing's outright preventing it from doing 1080p right now. Thanks for that. Tho, not available in Canada. Weird. I can do 1080p from an app, but not from Videocast. I received mine today. Will experiment and report. I got my Ethernet adapter today. It works as expected for the most part. The one thing I'm noticing so far is that it takes notably longer to bump up to a higher resolution on YouTube videos than it ever did over WiFi. Like I got four minutes into a Giantbomb quicklook before it finally got to HD and then at one point it dropped back. I'm not ready to complain yet. Maybe my Internet's just a bit crap today. We'll see after some more use. So I'm debating grabbing a chromecast or a roku skick for travel. I hate getting stuck watching cable in a hotel, I know wifi isn't always reliable, but I'm willing to deal with stutters. Anyone played with both? I like my Roku 3 a lot, so I am leaning toward the stick. I love them both. Roku is great because of the remote, but casting to Chromecast is magical. It's a toss-up there. For your situation though I would look into how well each works on hotel wifi. I have no first-hand experience, but I've read that you can now cast to a Chromecast without wifi. Rokus might not work, but I might be wrong. Please let us know which you choose.